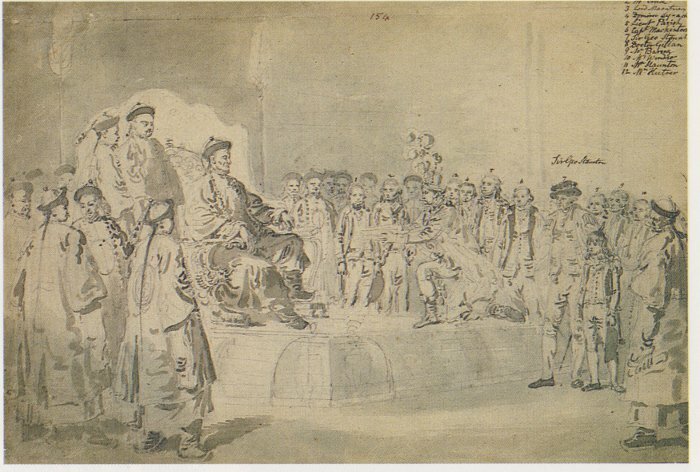 The presentation ceremony inside the Emperor's tent, sketched by Parish. 1 Lieutnant Colonel Benson; 2 Lieutnant Crewe; 3 Lord Macartney; 4 a Chinese - probably Mr Plumb; 5 Lieutnant Parish; 6 William Mackintosh, Captain of the Hindostan; 7 Sir George Staunton; 8 Dr Gillan; 9 Mr Barrow; 10 Mr Winder, an under-secretary; 11 Master George Staunton; 12 Herr Huttner. Quelle: Aubrey Singer: The Lion and the Dragon. The Story of the First British Embassy to the Court of the Emperor Qianlong in Peking 1792-1794. London: Barrie&Jenkins 1992.